TODAY’S BREW: Target brand Chocolate Cupcake AND IT REALLY TASTES LIKE ONE! NOW I ASK ALL THE QUESTIONS. You’ve come up with some really unique and beautifully disturbing ideas for THE CRIMSON CORSET that remind me of your poetry, which as you know, I’m in love with. Tell us about the crimson corset itself. Thanks for loving the poetry! The poetry loves you, too! Regarding the actual crimson corset … it refers to two things. First and foremost, it is a literal corset – a very special garment worn by my undead antagonist, Gretchen VanTreese, when she’s feeling uninspired. There are specific reasons this article of clothing is so special to her – macabre, gruesome reasons that I can’t expound upon without giving spoilers. I can say that some very special care went into the construction of the garment and because of those unnamed specifics, the corset represents to Gretchen a passage into power, and freedom from her past – it is a symbol of what she could become. Then there’s Gretchen’s nightclub, The Crimson Corset, named for that very special red bodice of hers. Purchased in 1912 when Gretchen and her band of Loyals settled in Crimson Cove, the Swiss-Chalet-style former lodge is notorious for its wild parties and long history of debauchery and excess. Built over underground tunnels of the rum-running days of Prohibition, there’s a lot more to this club than any of the locals know. This club was a ton of fun to write and it became a character in its own right as a lot of the action and danger takes place there. 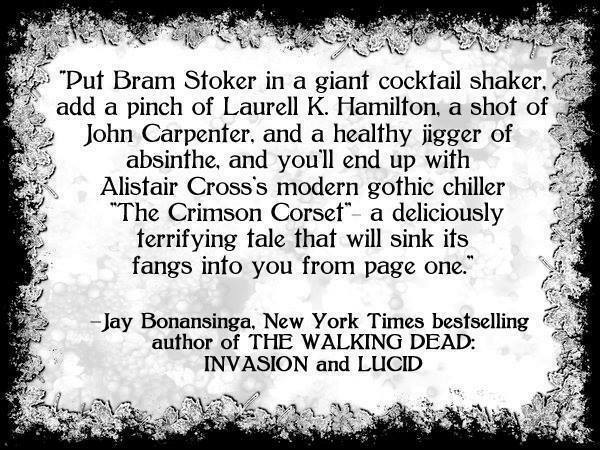 As for the book … The Crimson Corset is the first in a series titled The Vampires of Crimson Cove. It begins when a seemingly ordinary young man named Cade Colter who moves to the little California village of Crimson Cove where he discovers he’s not so ordinary after all. Unbeknownst to him, Cade has a genetic rarity that makes him very extraordinary, indeed … and very valuable Gretchen VanTreese. As Cade becomes the object of Gretchen’s obsession, the peaceful faction of vampires on the other side of town must call off the ancient and uneasy truce between their Loyals and Gretchen’s in order to protect Cade Colter. But Gretchen has already begun laying an elaborate trap that will put Cade, and everyone around him, in mortal danger. Tell us about Jazminka and her very unique weapon choices. Jazminka is Gretchen’s second-in-command, and she’s one of my favorite characters in this book. Born in Yugoslavia in the 1700s, Jazminka has had plenty of time to perfect her skills. She can drain a grown man of blood in six seconds or less without spilling a single drop, and she uses weapons of only the most fashionable kind to do it. From her steel-tipped stiletto heels, to the flowing chiffon of her glove-sleeves that serve as garottes, Jazminka is a woman who dresses to kill. Literally. We share a love of making vampires that stand out amongst the others in the genre, but you like your classic vampire to stay that way. What makes your vampires yours? I actually never envisioned myself writing a vampire novel and I haven’t read much vampire fiction in recent years, so it’s hard for me to say what makes my vampires different – because I don’t know what to compare them to. 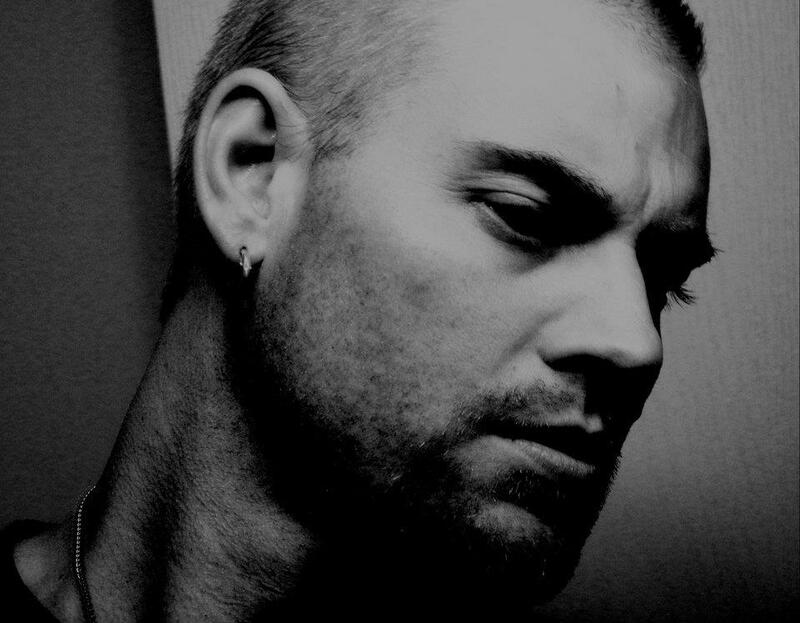 I do know that I have a respect for the traditional vampire genre, and didn’t want to stray too terribly far from that, so I hope that if my vampires are particularly unique for something, it’s because they aren’t so unique that they lose the integrity of the legend. You’re a self-proclaimed character writer. Tell me about it. Before I sit down to write, I do two things. First, I spent several weeks submerged in research and story development – and then I consider two to three possible endings for the story. After that, I just write. It’s difficult to explain how your characters can execute the story according to their own wills, but that is exactly what happens. Some writers understand this and some don’t. I think it’s just one of many inexplicable creative processes. How can anyone explain creativity of any kind? Where does it come from? It’s a slippery slope, my friend. You’ve got mermaids and vampires in one book! Talk! Ha ha! Well, the mermaids are vampires. Now, before you start thinking I have actual mermaids with sharp fangs swimming around and biting scuba divers, let me explain. Near Crimson Cove is a very real little town with an old, abandoned lodge called The Brookdale Lodge, which lent some inspiration to the club in The Crimson Corset. At the Brookdale, there was a glassed-in area of the pool where prostitutes dressed as mermaids swam for the men at the bar, and in much the same way people at restaurants can choose their lobster from a tank, these gentlemen would choose a “mermaid” for the evening. This concept fascinated me, and I created the vampires, Violet and Scarlett, to be the Crimson Corset’s finned – and fanged – ladies of the night. They are not, however, real mermaids. What do you see yourself writing next? I’m in the beginnings of the next solo novel which, although not related to The Crimson Corset, will feature some familiar faces. While writing, I’m often introduced to what I call “surprise characters.” These are characters that weren’t part of the original plan. Usually, these unplanned characters further the story and end up being great additions … other times, they go nowhere and either need to be cut out entirely, or moved to a different story. In The Crimson Corset, there is one character in particular, Deputy Nick Grayson, who really seemed to have a strong story behind him – more than I could explore in The Crimson Corset. I didn’t want to leave him behind so as I wrapped up The Crimson Corset, I gave him a job offer in a neighboring fictional town, where I will be able to tell his story. While this new book has no vampires – it focuses on angels and demons – it will be a lot of good, gruesome fun and I’m very excited about it. Also, my collaborator, Tamara Thorne, and I are finishing up volume one of the serialized Ravencrest saga, The Ghosts of Ravencrest. Immediately after that, the next volume begins, as well as another novel – a hard-hitting, fast-paced, balls-to-the-wall psychological thriller that we’ve been talking about for a while. So yeah. It’ll be a busy year. What’s the coolest thing you’ve ever done? Don’t hold back now. Honestly? Getting my name on a book next to Tamara Thorne’s! Seriously. If you don’t believe me, check out The Cliffhouse Haunting. There I am … right next to her. It’s awesome. And it was an incredibly fun book to write, too! I’ve been a fan of Tamara’s since the 90s, so to be able to meet my hero and write books with her is – without a doubt – the coolest thing that has ever happened to me. Alison smiled at him but there was something sinister about it. He looked around for anything they’d brought that needed to be taken back with them. But there was nothing, just sand … and the water. It gleamed like onyx and lapped at the shore, suddenly much closer than it had been moments before. “The tide’s coming in,” he said, but Alison wasn’t listening. She just sat, staring into the distance, that strange smile on her face. A new sound came – rain? – but he didn’t feel any of it. He looked up again. The sky was blacker and the stars were missing. He searched for the moon and couldn’t find it. Alison turned her head and faced him. “A storm’s coming.” Her once-pretty features were gone now, replaced by blue-white skin, hollow eyes, and thin lips. Her face had gone cadaver-thin and her body, clad in a bright orange bikini, had begun to show signs of decay. The dark sea water turned the color of blood and was close enough now that it lapped at the tips of her toes, as if tasting her. As the water – the blood! – receded, it took Alison’s flesh with it, leaving behind only the bones of her feet. She threw her head back and laughed, it might have pleased him if only it hadn’t sounded so mad. She scooted closer to the ocean of blood, tossing her head back and giggling as if the water – as it spirited away her flesh – was merely tickling her. She disappeared under the red water and moments later, the tide returned to the sea, leaving behind the smell of burning flesh – and what was left of Alison. His heart pounded and his stomach heaved at the sight. She was little more than bones now, with intermittent strips of charred, melted flesh hanging from her frame. To Ethan’s horror, his sister rose and began ambling toward him. Her jawbone worked feverishly before she found her terrible croaking voice. “You did this to me! You!” She raised her arms, her finger bones curling in as she reached for his throat. He tried to turn, but couldn’t. Glued in place, he felt the cold wet bones of her hand close around his neck. Ethan shot up in bed, his heart pounding high in his chest. He screamed, kicked the quilts off, kicking, kicking, grasping at his throat. His eyes flicked open and he was somewhere else: His bedroom. The smell of burnt flesh receded, making way for the stink of his own sweat, which drenched his T-shirt and bed sheets. He gasped for breath for several long moments. It was just a dream. Just a dream. Rain still tapped at the windowpane, reminding him of the click of finger bones. He shuddered, cold, and pulled the blankets closer. Reaching into the nightstand drawer, he retrieved a half-drunk pint of whiskey and took a long pull. This wasn’t the first dream he’d had about Alison – and it wasn’t the worst. He told himself he could handle it. Just let the whiskey do its work and go back to bed. It was just a dream. But he knew it wasn’t just a dream. It was much, much more than that.